Liquids are the second state of matter we will talk about. Solids are objects you can hold and maintain their shape. Gases are floating around you or trapped in bubbles. Liquids are found between the solid and gas states. Examples of liquids at room temperature include water (H2O), blood, and even honey. If you have different types of molecules dissolved in a liquid, it is called a solution. Honey is a solution of sugar, water, and other molecules. Liquids fill the shape of any container they are in. If you pour water in a cup, it will fill up the bottom of the cup first and then fill the rest. If you freeze that cup of water, the ice will be in the shape of the cup. The top of a liquid will usually have a flat surface. That flat surface is the result of gravity pulling on the liquid molecules. Let’s go back to the cup for a moment. If you put an ice cube (solid) into the cup, it will sit there and not change shape. As the cube warms and melts, the liquid water will fill the bottom of the cup and have a flat surface on top. Another trait of liquids is that they are difficult to compress. When you compress something, you take a certain amount of material and force it into a smaller space or volume. You force the atoms closer together. 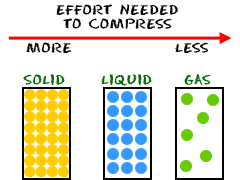 Most solids are very difficult to compress while gases are easier. You can find compressed gases in SCUBA air tanks. Liquids are in the middle, but tend to be difficult to compress because the molecules are already close together. You probably can’t compress a liquid with your hands. It takes a lot of force. Many shock absorbers found in cars and trucks have compressed liquids, such as oils, in sealed tubes. Without shocks, there would be a very rough ride for the driver and a lot of stress on the structure of the car. The shocks counter the extremes of the up and down motion by acting as a dampening device. Intermolecular forces are found in all substances. Some of the forces bring molecules together while others push them apart. Solids are locked together and you have to force them apart. Gases bounce everywhere and spread out. Many liquids want to stick together because of cohesive (sticky) forces that pull the molecules together. When you place a drop of water on a piece of glass, you will see it stay together as a drop. Cohesive forces keep the drop from spreading out. Cohesive forces also keep water molecules together if there is a drip on your faucet. The water sticks together until it is too heavy. It drips when the weight of the water drop overcomes the cohesive forces holding it all together. Evaporation occurs when individual liquid molecules gain enough energy to escape the system and become a gas. The extra energy allows individual molecules to overcome the intermolecular forces within the liquid.